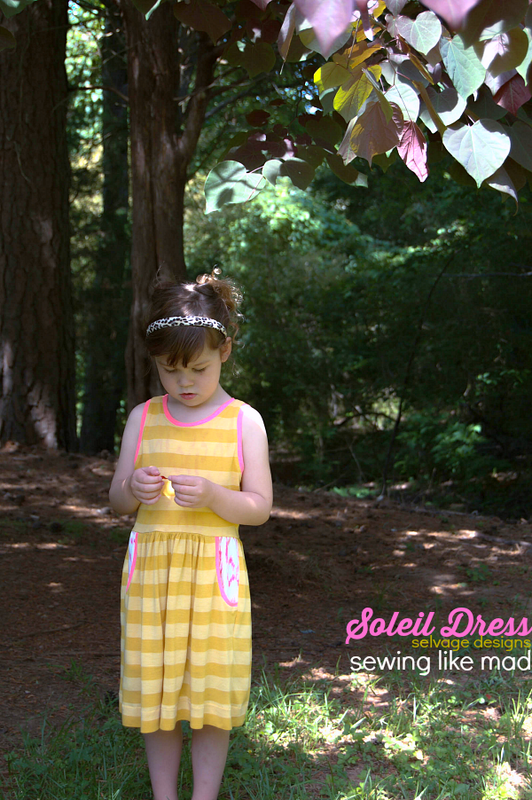 Sewing Like Mad: The Soleil Dress by Selvage Designs. 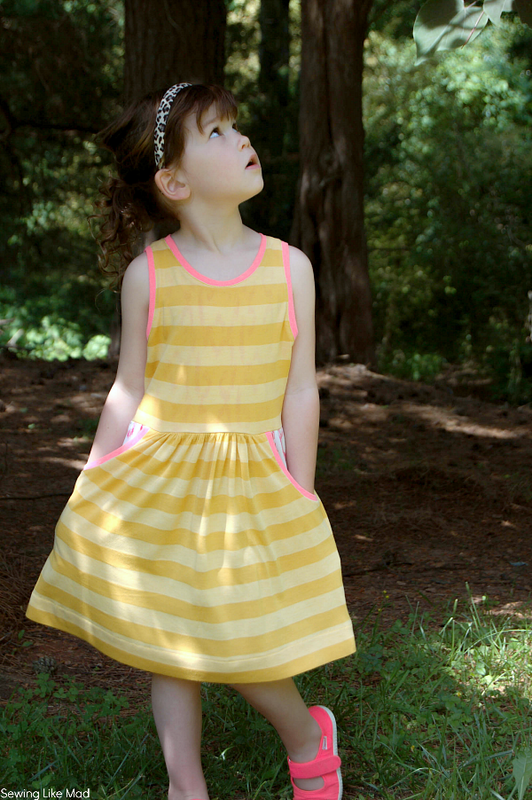 Even though I am cutting heavily down on blogging this summer I was totally up for reviewing the Soleil Dress from Selvage Designs. 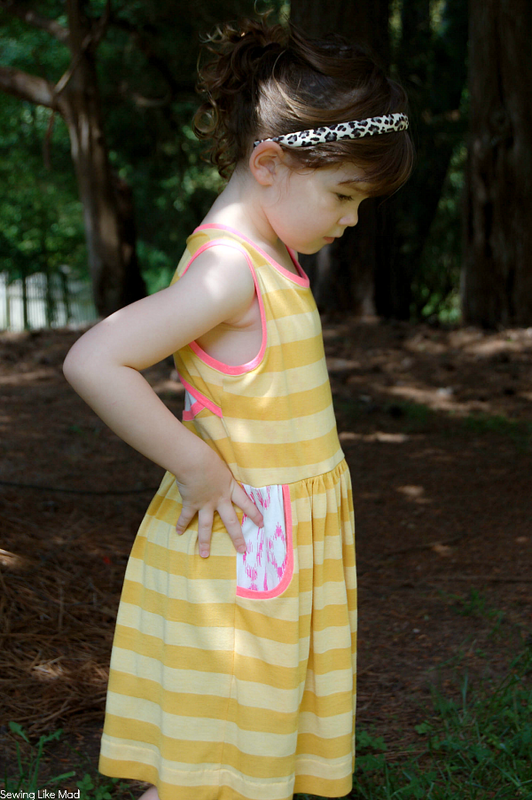 Both me and my kids LOVE knit fabric dresses and with the cute details such as pockets and an optional open back I was game. As mentioned, the pattern has an optional open back. I loved the detail but kind of that did not wanted an open back. I can't even explain why, it's not because I do not like it. Maybe because to me knit dresses are super (perfect) everyday style and open backs I associate with a more dressed up style...I dunno. Well, no matter what I found a solution....a solution that solved several problems actually but let's talk about the back first. I cut both versions of the back pieces - open and closed and put them on top of each other. Problem solved! 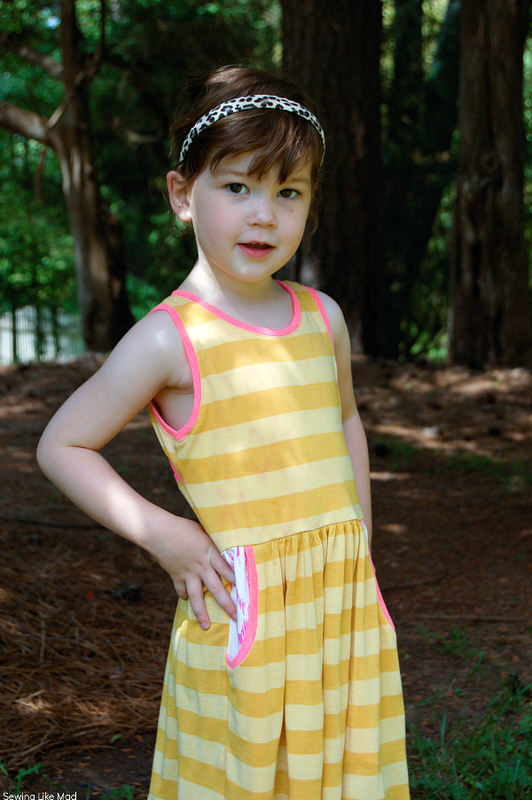 I actually did the same with the front bodice which solved another problem....that the stripe mustard fabric I had chosen was actually slightly too thin and therefor see through. The third problem that the double layer solved (and none of them are the pattern's fault, let's just be clear on that) is that the mustard fabric did not have a lot of stretch either and would not have been able to fit so close as the pattern recommends. The tight fit is recommended because otherwise the back opening is going to gape open....which it did until I stitched it to the extra full layer just below the rib. Phew, I guess sometimes you are allowed to be lucky. I did have one thing I was not happy about with this pattern. I did not appreciate that I was not given any length measurements for the rib for pocket openings, armscyes, back opening and neckline. Lauren, the designer, is completely right when she says that all knit is different and it is therefor impossible to give an exact number. Completely true! But I could either have wished for some approximate numbers together with some stretch % recommendations, so I had an idea OR at least the measurements for the openings where the rib had to be sewed on to - again just to have an idea of how much to cut. I got this pattern for free but if I paid money for it, I would have been fairly annoyed having to do the job that I felt the person I bought the pattern from should have done. I might be thinking like that because I can make my own patterns, so if I should spend money on a pattern it would be for two reasons only.....because the design is so amazing that I could not live without it and because I want to skip some steps and have an easier sewing process....and not be forced to make parts of the pattern myself. Maybe I am just lazy, ha? But that is the way I feel about that. I also missed a few notches here and there.....but what can I say, I am a notch freak, you already know that. People do not have to add notches to their patterns just because I love them but I will miss them when they are not there, so I thought I would mention it. Besides the two critiques I mention above I like the pattern. Seams are matching up, lines looks great and I love the digital illustrations. And the result....well, the result speaks for itself....it is a great dress and Evelyn loves it. She actually loves it so much that she tagged it with black permanent marker the other day - arghhhhhhhh. On the hem and right under the back opening (how did she even do that??). Anyone have any magic washing tips that does not included the usual soaking, scrubbing, spot remover applying tricks? They would be greatly appreciated!! The fit of the dress is great too. Let me just explain why it looks like it is very loose under the arms (see photos above). It is totally my fault....and the fabric...which I choose, so again back to my fault. When I was done sewing the dress, I squeezed it over a dress form that was like a tad too big and that made the fabric stretch out. I did not quite realize this until it was too late that it was obviously the faux pas with the too big dress form that was the problem - let's blame the confused mommy brain or something, shall we, ahem. After I washed and tumble dried the dress it pulled itself back to normal size. By the way the concerned look on her face is caused by a bee coming too close. Oh man, this poor girl is terrified of them. Thank you Lauren for having me review your pattern. such a great idea with the back! i love the detail of it to but knew it was just not my girls style. i never would have thought to make it that way! your so creative with such things! She is looking so grown up!! I love the way you did the back. Never would have thought of that :) The neon rib and matching shoes is awesome! Love your style. I like your solution for the back opening. Keeps the cute design adds extra coverage! You are so smart my friend!!! Love the dress and the colors! Love the detail in the back. evelyn looks so big! When did she grow so much? :) The dress is adorable! I love it! Thanks for the honest pattern review! I hate getting halfway through a pattern and realizing that i've paid for something that's less than i really could have figured out by myself. I love the detail in the back, totally unexpected. The stripes are perfectly lined up! Of course! :) And I love your fabrics and details. What a smart solution to the open back! I avoid open back designs and never thought of what you did. This is genius!!! what a fun dress! and i love that you were very open with your review! Great idea for the back! That stripe matching on the side is SO good. I love what you did with the back, that is really fun and you could do a lot with that! 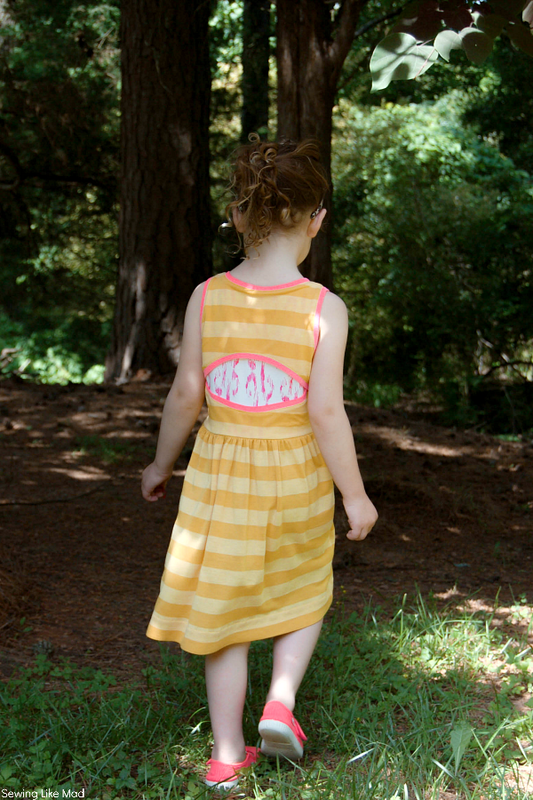 I love the open back for summer, but it wouldn't work for school and, well, the 8 months of winter we have around here, so this is a nice little alternative! And yes, notch all the things!